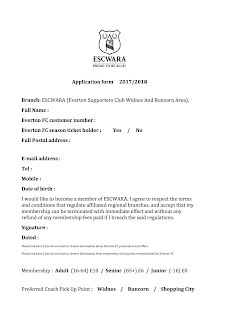 If you are thinking of joining ESCWARA for next season you will need a customer number. This will be used when applying for away tickets on your behalf. Sun, 2nd July 2017 , 1.00pm to 3.00pm The Kingsway Hotel, Widnes. Tue, 4th July 2017, 6.00pm to 8.00pm The Kingsway Hotel, Widnes. Tue, 11th July 2017, 6.00pm to 8.00pm The Wilsons, Runcorn. Sun, 16th July 2017 , 1.00pm to 3.00pm The Kingsway Hotel, Widnes. Tue, 18th July 2017, 6.00pm to 8.00pm The Kingsway Hotel, Widnes. Tue, 25th July 2017, 6.00pm to 8.00pm The Wilsons, Runcorn. Sun, 30th July 2017 , 1.00pm to 3.00pm The Kingsway Hotel, Widnes. Sun, 13th August 2017 , 1.00pm to 3.00pm The Kingsway Hotel, Widnes. The purpose of this meeting is for the renewal or to take new memberships. 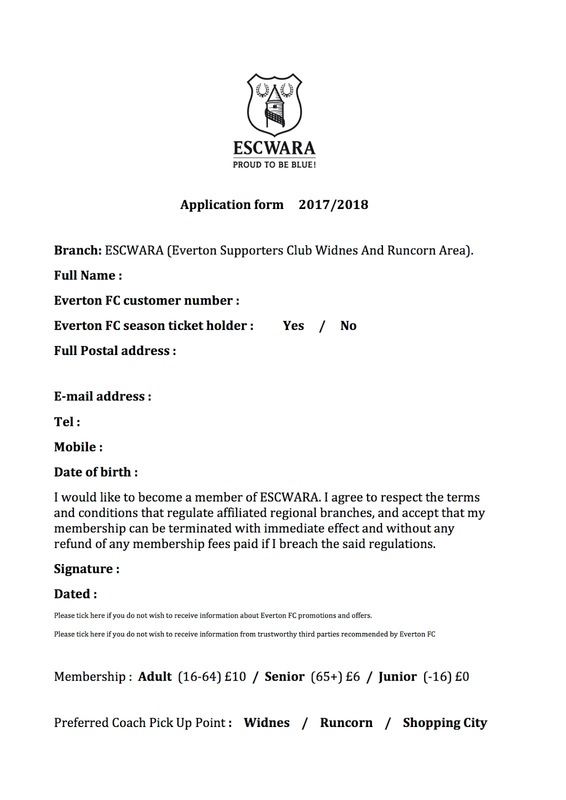 Please click on the membership form below to print of any copies required.